Balance charge and discharge Li-Poly packs up to 6 cells. Programmable. 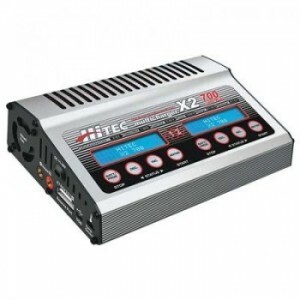 Expanding on the success and reliability of Hitec's X2 AC Plus, Hitec offers its X2 AC Pro. 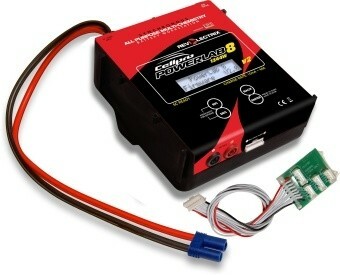 The AC/DC dual port charger/discharger delivers 200 watts of power in AC mode, and up to 300 watts total output in DC. Its versatile power distribution mode lets you optimize the output in AC mode for maximum charge efficiency. 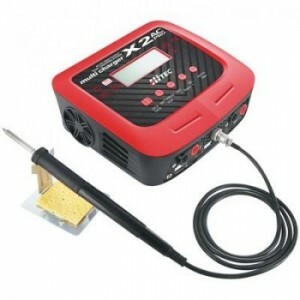 Additionally, the X2 AC Pro is equipped with a built-in heavy duty 60W soldering iron with adjustable operating temperatures from 400 to 840F (200-450C), making it a convenient and handy feature at the field as well as at home. Easily store and recall 20 charge/discharge profiles. Capable of charging most battery chemistries, including the latest high voltage LiPo's (LiHV), this all-in-one charger has advanced functions such as Battery Meter and Battery Internal Resistance Meter modes. For the ultimate convenience, you can also configure your settings and keep an eye on your charge progress with your Smartphone or PC. 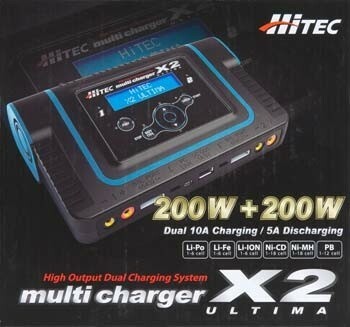 Size: 7.76 x 7.17 x 2.8"
Hitec's new X2 charger is similar to the X4 except 200 watts charging power per port is allowed. Charges Lipo/Lion/Life(A123) packs up to 6S, PB (lead acid) up to 10S and NiCad/NiMH packs up to 15 cells. Both ports run completely independently from each other. Maximum 10 amps charge current, 5 amps discharge current. Power up your larger packs more quickly with this charger. 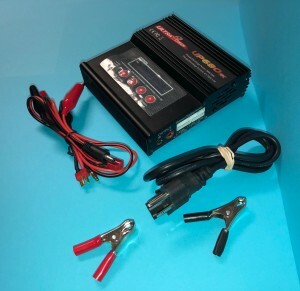 Dimensions (W x D x H): 8.9" x 6.7" x 2.6"
The X2-400 Multicharger is a microprocessor-controlled, two-port battery charger and is the ultimate in high-power battery chargers capable of charging all types of high amperage batteries. Two identical yet independent 400-watt power output ports combine for a total of 800 watts of pure charging power. Each port charges at up to 20 amps and discharges at 0.1-5 amps, offering the perfect solution for batteries of all common chemistries, including 1-6S Lithium (LiPo, LiFe and Li-Ion), 1-15 cell NiCd/NiMH and 2-20V lead acid packs. Additional features include internal cell balance, high contrast LCD displays and important warning and safety functions. Designed with a stylish aluminum case for rapid heat dissipation, the X2-400 offers pro level drivers and pilots the most powerful dual-port charging capacity on the market. 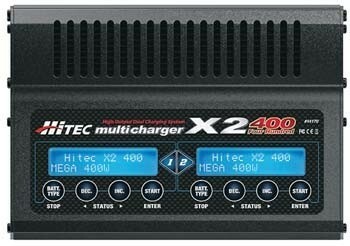 Hitec's powerful X2-700 Multicharger, a sophisticated charging choice for all your high capacity batteries. This DC powerhouse features two 700-watt output ports for increased capacity and supports all common chemistries, including the latest LiHV cells. The microprocessor control and internal resistance meter make this the star in any charging application. Hitec's free "Charge Master" software (V2.02 Required) allows full PC control of the X2-700 through its integrated USB port from basic setup to full software analysis of your battery's health and performance. The new Synchronous Mode allows the second output port to automatically mirror your channel one settings to charge multiple similar batteries with minimal setup time. Reliable and durable, this is a must-have charger for all seasoned hobbyists. Cellpro POWERLAB 8 is a 40A, Dual Port 1344W Multi-Chemistry Charger. 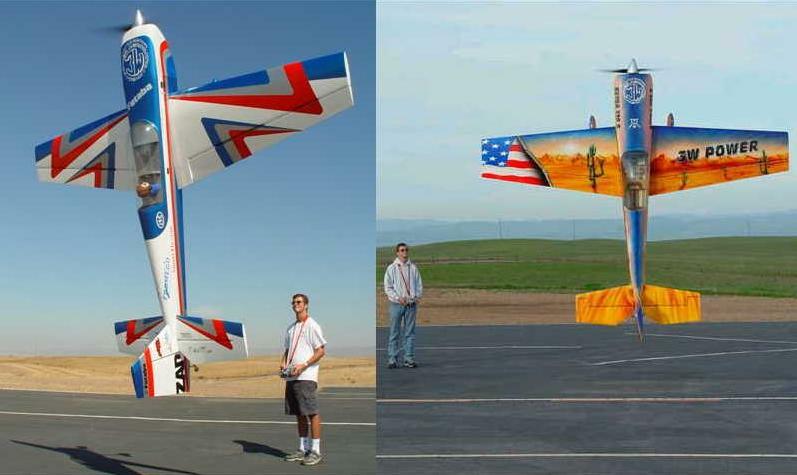 Regenerative discharge capability. encompassing battery management and analysis tool. 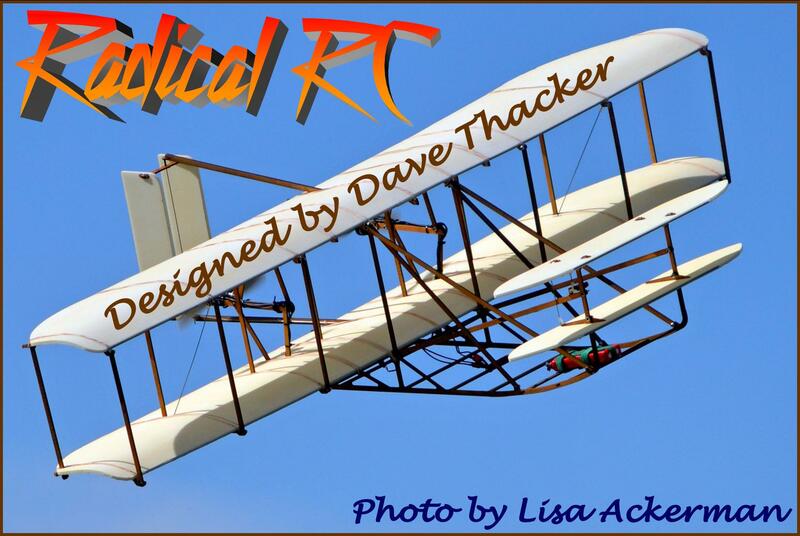 It is compact, powerful, and easy to use. Combining this kind of performance with the ability to autonomously cycle batteries, graphing all aspects of charge and discharge at the cell level (using the free Charge Control Software) and over multiple cycles provides you with key information about any chemistry battery you might have. As well it will tell you the quality of your battery by monitoring and graphing internal resistance at the cell level; more accurately and faster than ever. We consider Cellpro chargers to be among the highest quality availble in the marketplace today. 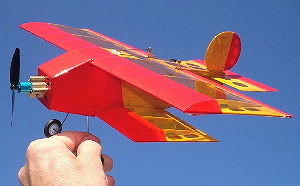 A Revlectrix/FMA style 8s balance board is showin in the photo but not included with the unit. Be sure to order at least one useful balance board in the drop downs below. 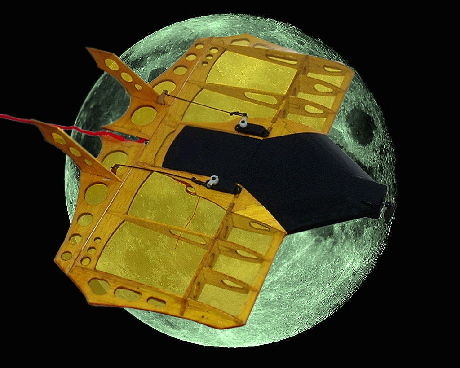 This unit will not charge Lithium type batteries without at least one balance adapter board. Check manual download for all specifications. Download: Cellpro POWERLAB 8 User Guide. 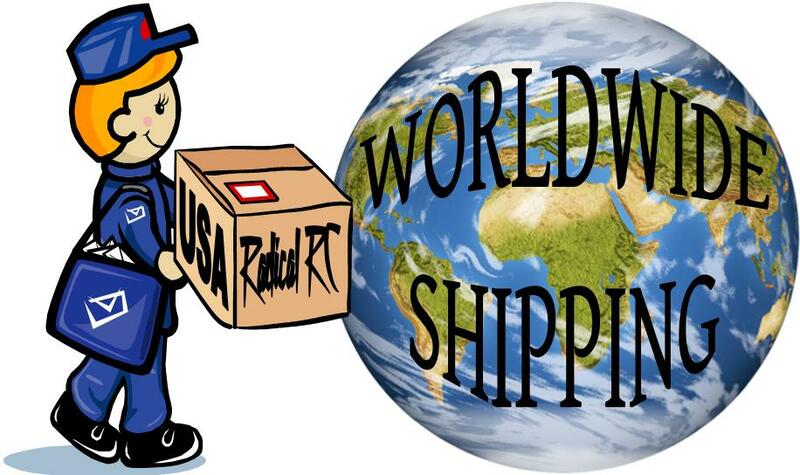 In the rare event of any warranty issue with a Cellpro charger, you will handle it directly with the USA service center Revolectrix.com (FMA Direct). We are happy to provide purchase date proof/invoice copy upon request.